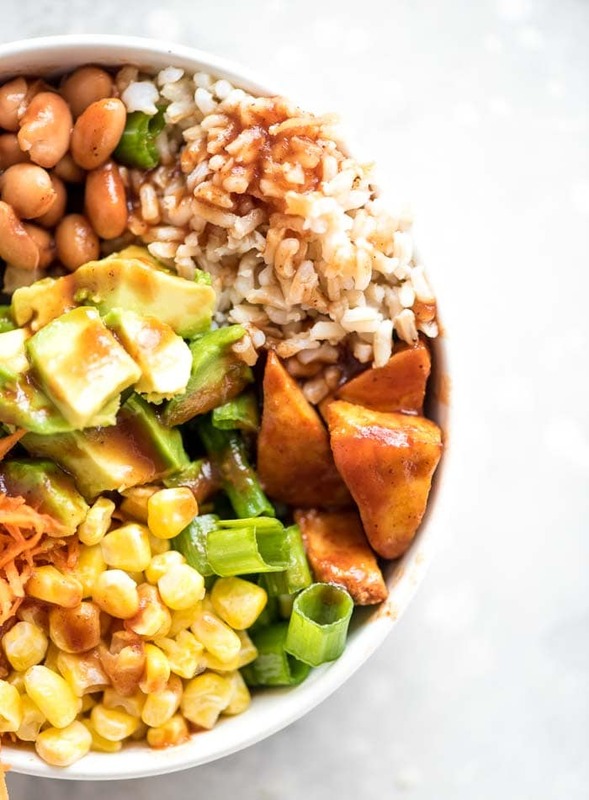 These vegan BBQ rice and beans bowl features brown rice, black beans and a homemade BBQ sauce to top it all off. 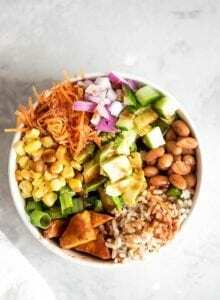 The bowl is made with healthy ingredients like baked tofu, avocado, carrot, cucumber, red onion, corn and green onion and it comes together to create an incredibly flavourful and delicious plant-based meal. I went with a homemade BBQ sauce for this recipe that I made from a base of organic ketchup. It’s really easy to make and works well as both the marinade for the baked BBQ tofu and the sauce for the bowl. Aside from the organic ketchup, all you’ll need is pure maple syrup, soy sauce, vinegar and spices. It’s refined sugar-free and can be gluten-free if you use gluten-free tamari instead of soy sauce. I would recommend trying the homemade sauce but if you’re in a pinch, you can use store-bought vegan BBQ sauce. To make the baked BBQ tofu, I marinated the chopped tofu in the BBQ sauce for a few hours before baking. If you’re short on time, you can skip the marinating but it does result in a much more flavourful final product. For an even better result, you can press the tofu for 30 minutes before marinating in order to squeeze up the excess water so the tofu can soak up all that BBQ flavour. I didn’t press mine but for even more flavourful and crispy baked tofu, feel free to do so if you have time. Pressing tofu is very straightforward, just wrap a block of tofu in a dish cloth, place it on a plate and then place a few heavy objects such as cookbooks on top of it. Let it sit there for 30 minutes and then use as you normally would. These delicious, hearty bowls are full of texture and BBQ-inspired flavours such as corn, red onion, pinto beans, green onion and baked BBQ tofu. To up the nutrition, they’ve also got brown rice, raw grated carrot, cucumber, carrot and avocado. 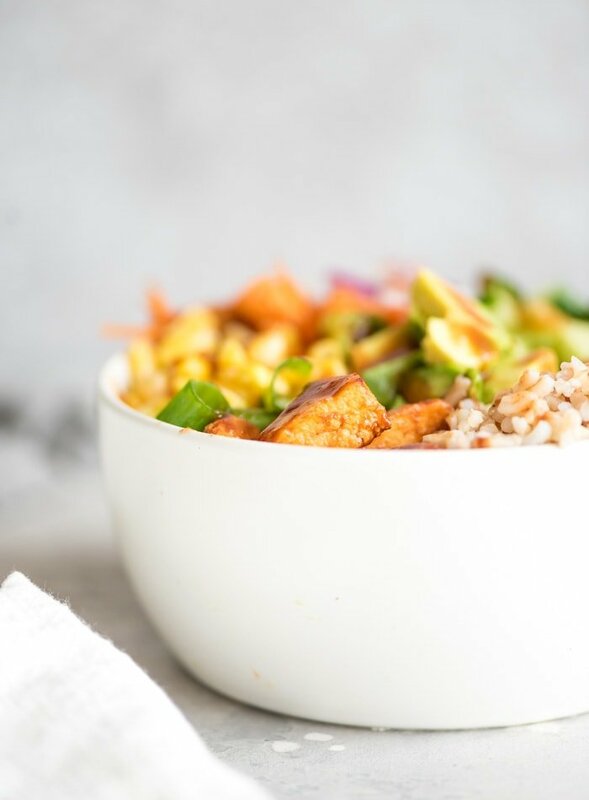 These bowls are healthy and well-balanced with a good amount of plant-based protein and complex carbohydrates. It’s also rich in minerals, antioxidants and fibre. These bowls come in at approximately 512 calories per serving with 92 grams of carbohydrates, 8 grams of fat and 23 grams of protein. You’ll also be getting 13 grams of dietary fibre, more than your daily vitamin A, 30% of your daily vitamin C, 50% of your daily calcium and 30% of your daily iron. These bowls are completely plant-based and can be made gluten-free by using gluten-free tamari instead of soy sauce in the BBQ sauce. 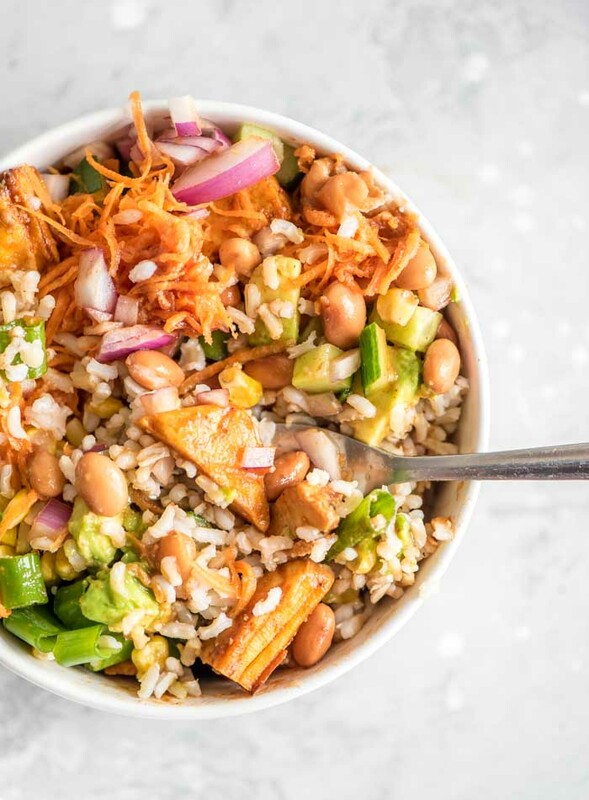 These flavourful rice and bean bowls are filling, satisfying and full of nutrition. The homemade BBQ sauce is easy to make with basic ingredients but you can use store-bought in a pinch if needed. Make the BBQ sauce. Prepare the BBQ sauce by whisking all the ingredients together in a small sauce pan and bringing to a light boil. Reduce heat and simmer for 15-20 minutes, stirring occasionally until it’s thickened slightly. Marinate the tofu. Place the chopped tofu in a bowl or shallow dish and add about 6 tbsp of the BBQ sauce. Allow to marinate in the fridge for at an hour up to overnight. Bake the tofu. Preheat the oven to 400 degrees. Place the tofu pieces on a silicone mat or parchment paper lined baking sheet and bake for 15-20 minutes. Remove from oven, add a few more spoonfuls of BBQ sauce and stir on the pan to combine. Bake for another 15-20 minutes until golden brown. Cook the rice. If you haven’t cooked the brown rice already, do that while the tofu is baking, according to package instructions. Build the bowls. 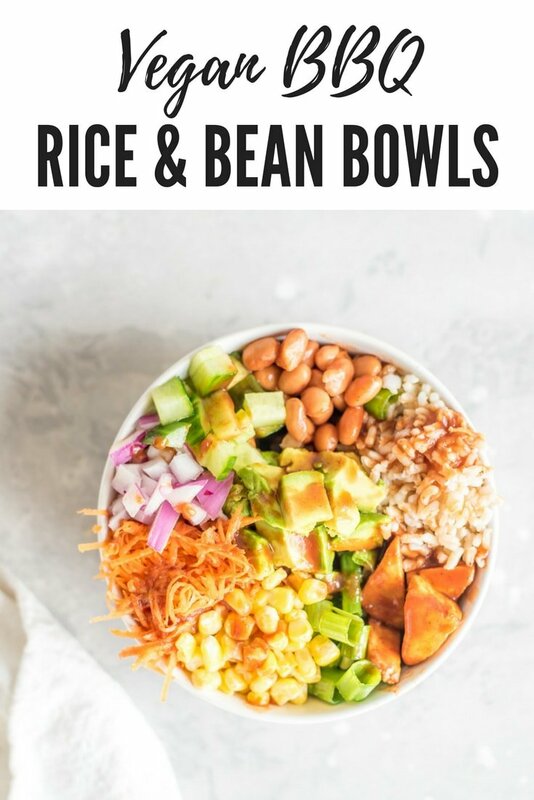 To make the bowls, divide the rice, pinto beans, carrot, corn, red onion and green onion amongst 4 bowls or containers then top off with the remaining BBQ sauce and the diced avocado. If you don’t have time, it’s not totally necessary to marinate however the result will be much more flavourful this way. If you want to take it a step further, press the tofu before marinating. The sauce and tofu make enough for 4 bowls. Adjust the rest of the ingredients for how many bowls you want to make. 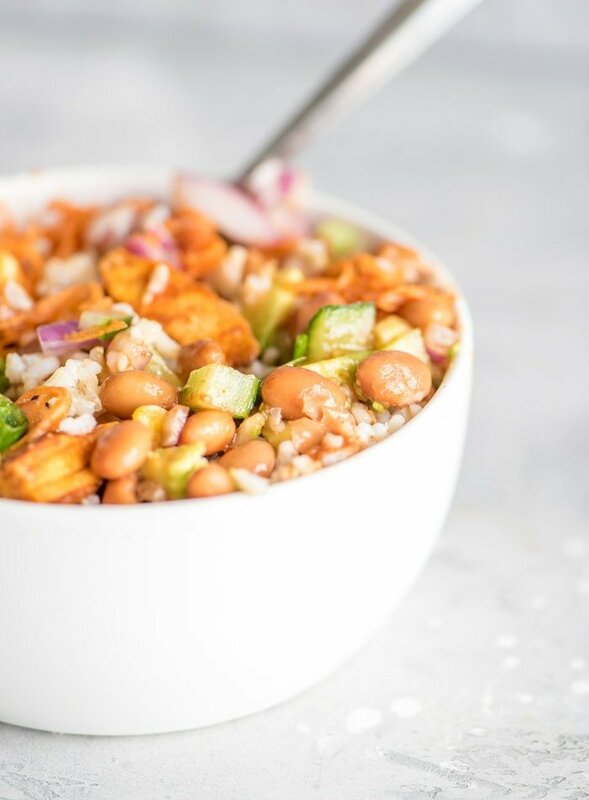 The rice, beans and veggies don’t have to be exact. So excited to try that BBQ tofu! Love how it adds extra protein to the rice and beans.